We are excited to announce that we have added a new member to the CASE team. Josh Dixon recently joined our team as the CASE Marketing and Communications Coordinator. In his role here at CASE, Josh will be managing our web presence, social media channels, and among other things, help us launch a new CASE podcast this fall featuring conversations with social impact leaders! Keep an ear out for more news on this over the summer. In the meantime, send your ideas about what you’d like to see from CASE communications – or just say welcome to Josh! – through CASE’s Twitter, Facebook, or email. We’re excited to continue to innovate in how we communicate best practices about social entrepreneurship and impact investing, amplify the voices of impact leaders, and share news of our work to help accelerate change. 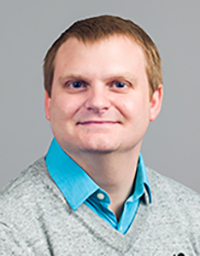 Josh has a Bachelor’s of Marketing from Cedarville University, a small liberal arts university in rural Ohio. He comes to us from the Department of Psychiatry and Behavioral Sciences at the Duke School of Medicine. In his role as the department’s Marketing Specialist, he focused on creating strategic updates to both internal and external communications. Josh and his wife moved to Durham just over 4 years ago and are both Duke Employees. We are so thrilled they have both embraced the Duke and Durham cultures.